Heilman Renovations was hired to find a leak in this North Vancouver bathroom. On inspection of the bathroom we found that the plumbing in shower and drains were leaking badly requiring a full bathroom and laundry renovation. This is the before picture of the laundry room and bathroom that required a full renovation. Here is the old sink cabinet in the laundry room that required renovating. This bathroom was quite dated in addition to the substantial plumbing leaks which required us to fully renovate everything. The leaking shower was the main item that started this laundry and bathroom renovation project. After removing the bathroom and laundry room finishes we checked the framing to see if its acceptable for the renovation. In this picture we are figuring out what to do with the plumbing for our bathroom renovation. When renovating a bathroom we have to make sure that the walls are square and plumb in the shower, this makes a beautiful bathroom renovation! Here is Joe Heilman cutting lumber for the framing in this bathroom renovation. The framing in the bathroom renovation has to be perfect for the plumbing rough-in. 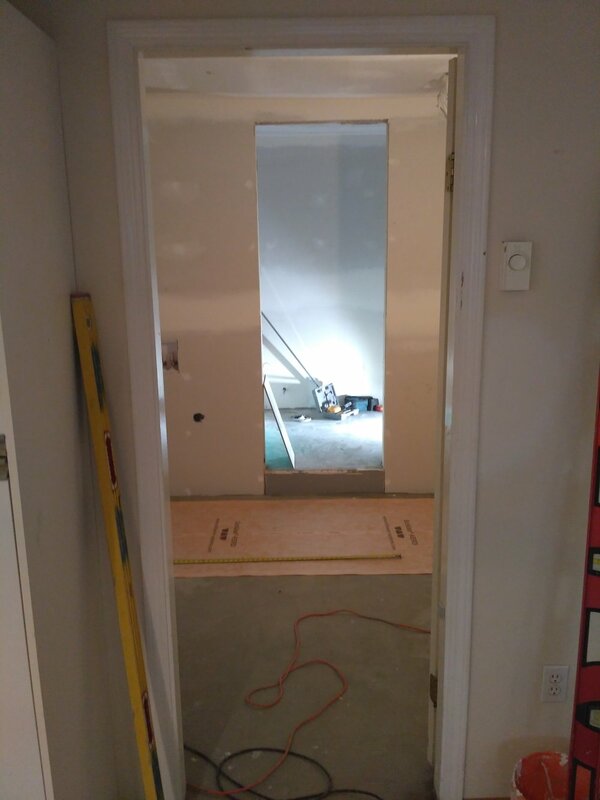 In this bathroom renovation we had to build up the floor because the plumbing needed the extra slope to get to the street. Here our electrician is rewiring the bathroom to complete this renovation. Renovations from the previous 70 years made the wiring complicated. When doing renovations we try to bring the electrical up to code. Joe helps install the bathtub with the plumbers from John G Plumbing to complete this bathroom renovation. This bathroom renovation is getting closer to completion now that the electrical and plumbing rough-in are complete. Heilman Renovations drywall crew installs the board in our bathroom renovation project. This bathroom renovation project is coming along now that the drywall is installed. The tilers began laying out the tile installation for the laundry room renovation and bathroom renovation. The Schluter waterproofing on the shower walls around the bathtub in this renovation is being layed out for tile installation by the Heilman Renovations tile installers. Joe Heilman installs bathroom door casings and trim to complete the laundry and bathroom renovation. Here Joe sets the IKEA sink on the bathroom vanity countertop to make a beautiful modern bathroom renovation. This IKEA vanity countertop and sink look amazing in this bathroom renovation! The mosaic tile boarder in the shower gives some visual excitement in this bathroom renovation. This bathroom renovation needed a medicine cabinet to give some extra storage. This bathroom renovation picture was taken with a fish eye lens and shows all the fine details in this bathroom. This is the final picture of our bathroom renovation project. The laundry renovation had us installing IKEA cabinets and countertop. Here is the final shot of our laundry and bathroom renovation project!